Opening the bottle and you definitely pick up some exotic spices in there, which develop in the glass and really fills your head space. It reminds me of toasting whole spices, it’s very rich and rounded but with that fresher zing at the end from the lime. Adding a splash of water and it louches to turn slightly milky. On the tongue the black pepper tingles the tip of your tongue along with the freshness of the ginger which wakes your mouth up after a day of work. I quite like this. The tartness of the lime cuts through the warmth to just lift it at the end. 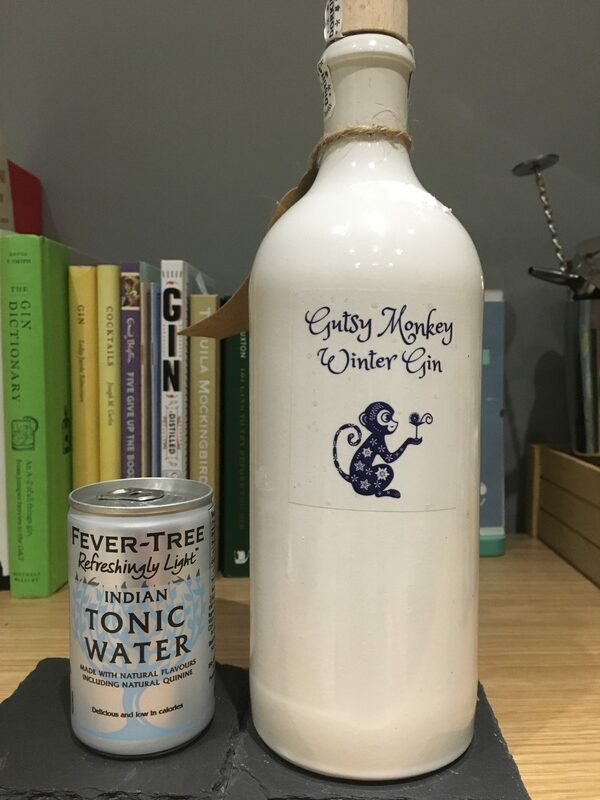 Mixing it with some Fever Tree light, and I’m less of a fan. There’s still a warmth from the pepper and spice, but it’s less intense. And this isn’t one of those gins were being less intense helps it, I liked the heat. It still leaves your mouth tingling but the acid from the lime is more pronounced and it feels more citric than before. It’s not awful, and once you’re used to the change in flavour it’s quite nice, but personally for me I think this is better neat then as a g&t. 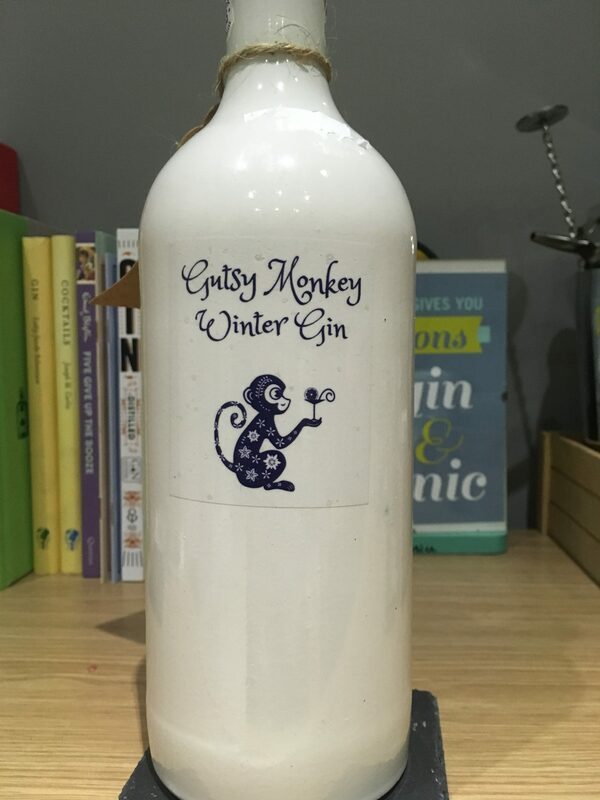 A 70cl bottle of Gutsy Monkey Winter Gin is available from Master of Malt for £44.95 (at time of writing). I know this is small batch and hand bottled in lovely ceramic bottles, but I wouldn’t pay that. It’s nice, but not that nice. 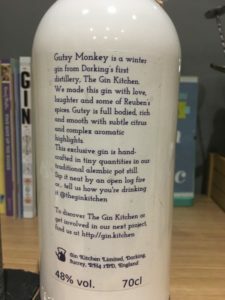 You can find Gin Kitchen on Facebook, Twitter and Instagram. 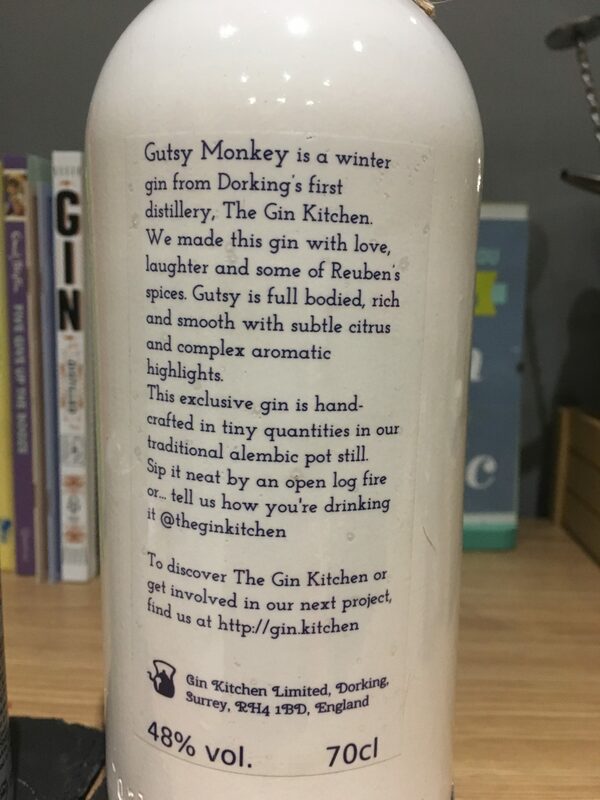 Have you tried Gutsy Monkey? Let me know your thoughts on Twitter and Instagram.